Rose City was once referred to as “The Home of the Artesian Wells” because of the vast number of wells still found as the main water supply of the city itself. In 1871, Hiram Hodge and William (Deacon) Rose first made their way over wilderness trails to this section of Northern Ogemaw County. Mr. Rose later returned to his native New York State, but his son, Allen D. Rose, remained. Allen Rose and M. H. French, a banker from nearby West Branch, formed a partnership known as “French and Rose Land Company” and began pioneering a new settlement known as “Churchill”. Other families soon joined the Rose family in taking up land. Lumber operations logged off the giant pine and timber and Churchill grew until it consisted of a general store, a post office, boarding houses and settler’s cabins. Churchill was located one and one half miles west the present site of Rose City. In 1892, the town was moved to its present location and renamed “Rose City” in honor of its founding father, Allen D. Rose. Mr. Rose erected a large general store in the new town site. 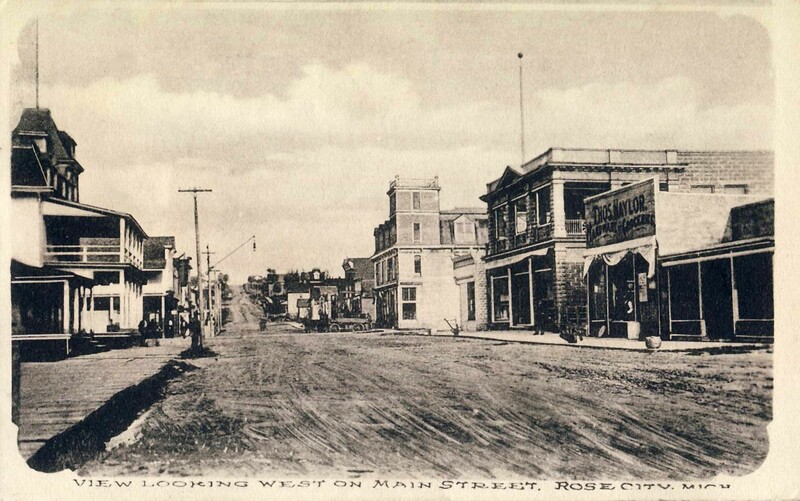 Although Rose City was never incorporated as a village, in 1905 it was incorporated as a Fourth Class City. 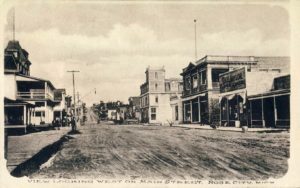 Early morning, on April 3, 1910, fire destroyed almost the entire business district of Rose City except for Bell’s Hardware and Naylor’s store. Thirty buildings were gone. The lumbering center called Rose City ceased to exist as many businesses never rebuilt. Tourism began as a business in Rose City in the early 1930’s. Summer attractions were many with 75 lakes within fifteen miles of the city limits. Fishing, hunting and camping thrived in the area. From 1945 – 1960 the area saw many civic improvements – sewers, hard surfaced streets, street lights, etc. In October 1962, the school system was consolidated with West Branch becoming West Branch – Rose City Area Schools. The first settlers came from Ohio about 1879. Emmor Lupton (thus the name of Lupton) and his sons had about 300 acres of land with about 125 acres cleared. In 1889 a saw and shingle mill was built on the Levi farm. The mill stood at the corner of Doll and Oyster Roads, It had a capacity of 20,000 feet of lumber and 25,000 shingles per day. Lupton, which consisted of a store, church, and post office, was built on the hills north of the present site, and was called “Lane Heights”. Because of a better location and accessibility to the railroad and river, the town was later moved to its present location. Lupton was home to the Graceland Ballroom. This venue was frequented by the infamous Detroit organization The Purple Gang. They controlled most of the illicit underworld operations in the Detroit are. Today, the Rose City – Lupton area is populated by people who enjoy the simple life of a small town. Businesses still largely depend on tourism dollars. This area is the heartland of Michigan’s tourist area with lakes and streams throughout. The Rifle River Recreation area lies just to the east of Rose City and hosts thousands of tourists and outdoor enthusiasts every year who come to enjoy canoeing, fishing, snowmobiling, cross country skiing and sight-seeing. The area is surrounded by State Forest with some Federal land with forests and campgrounds. Tourist-related businesses include motels, resorts, service stations, trout ponds, sporting goods suppliers, bars and party stores. Other employment is found with home and cottage construction companies, lumber and hardware businesses, and several area factories. Retirees who move here from larger cities find the area inviting and convenient. Rose City has been re-born as the recreational area of the future.